Sailing Ship Adventures is a specialty travel service that represents sailing ship owners and operators, including some of the sailing world&apos;s best-kept secrets. We book voyages for our customers on a wide variety of sailing ships ranging from the largest full rigged tall ship in the world (The Royal Clipper, at over 400 feet in length) to smaller vessels (ranging from 60 to 100 feet in length), as well as aboard crewed chartered yachts. Unlike your local travel agent we do not represent just a few ships and tour providers, but a wide variety of ships in many different destination areas. We have researched tall ships and sailing ship vacations the world over. Our extensive knowledge of sailing ships and the resulting roster of vessels in Our Fleet means that, no matter where you would like to spend your next vacation or what you would like to do there, we can find the perfect voyage for you. Our Fleet is comprised of more than 100 full-rigged tall ships, brigantines, barkentines, schooners, and smaller vessels. This range of ships, from the most luxurious to the more spartan, offers you the widest range of choice available. We will continue to update this roster as more ships enter the worldwide fleet. Our ships sail to destinations through the world, ranging from popular itineraries in the Caribbean and Mediterranean Seas, to ocean crossings, to exotic areas such as the fjords of Patagonia, the Andaman Sea, and the Queen Charlotte Islands. Sailing to these destinations offers opportunities to experience exotic locations in an up-close and intimate way that is not possible on traditional cruises. Smaller vessels are able to stop at smaller, out-of-the-way ports of call not accessible to large cruise liners. 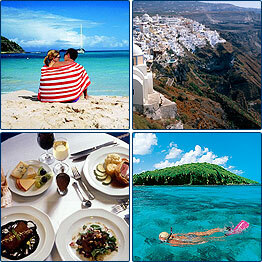 The following is just a small sampling of long list of exciting destinations visited on our many sailing vacations. Because most of the ships in Our Fleet do not maintain online, real-time booking or inventory status, we cannot book your Sailing Ship Adventure online. We need to contact the ship owner/operator to determine space availability and make reservations. You may call our toll-free phone number 1-877-882-4395, fill out our Online Booking Request, fax us [1-339-686-3099], or simply e-mail us at info@sailingshipadventures.com with your vacation requirements. Please be sure to include your phone number so we may call you back. Our web site has been designed to showcase our wide variety of ships and voyages and to help you in finding voyages that match your plans. Please consider this site as a constantly-changing composition. We will continue to add ships to Our Fleet, so you might like to bookmark the Sailing Ship Adventures web site in your browser. If you have any questions or are unable to find exactly what you are looking for please contact us by toll-free call, email or fax. Our Frequently Asked Questions page will be updated often to address our clients&apos; most pressing queries.